ENUGU— Nigeria’s former Minister of Aviation, and presidential spokesperson of the Goodluck Jonathan campaign organization, Mr. Femi Fani-Kayode, yesterday, received hearty cheers and loud applauses by congregants at the meeting heralding the coalition of the peoples of the Southeast, South-West, South-South and Middle-Belt groups. The convocation tagged, “Handshake Across The Niger: A Celebration Of Igbo/Yoruba Friendship Beyond Brotherhood,” as organised by a pan-Igbo socio-cultural group, Nzuko Umunna, under the aegis of Ohanaeze Ndigbo, was reportedly an alliance between the Igbos, Yorubas and the Middle-Belt groups in which they rekindled the friendship and partnership that existed between Maj. Gen. Johnson Umunnakwe Aguiyi-Ironsi and Lt. Col. Francis Adekunle Fajuyi. In his speech at the event, the former Minister who represented Governor Ayodele Fayose of Ekiti State, briefly highlighted the massacres and sufferings of the peoples of the Southeast, South-West and Middle-Belt while assuring that the coalition will guarantee a united front capable of confronting the common enemies of the people. He further stated that, “the sufferings of the people of the Southeast is sonething that we in the rest of Nigeria have to apologize to you for you lost over 2 million people during the civil war, 1 million children. “You(Igbos) were slaughtered on the night of July 28, 1966, when 300 Igbo officers were slaughtered in one night and the great Fajuyi who sacrificed his life to build this bridge and the great leader of our country at that time, the great Ironsi. All of them stood together and they all died together. Kayode also raised his voice against the unlawful killings, disappearance and arrest of members of the Indigenous People of Biafra, IPOB, and its leader, Nnamdi Kanu, saying he would always stand by him. According to him, “It is absolutely reprehensible, unacceptable, it is wrong. They came in, rhey slaughtered, killed them and as a friend of the great Nnamdi Kanu, I will never stop voicing out what they did to him. I ask them to produce him. While calling on the federal government to recognise the rights of the people of the South-East and South-West, Kayode demanded for the proscription and designation of Miyetti Allah and Fulani herdsmen as terrorist organizations. 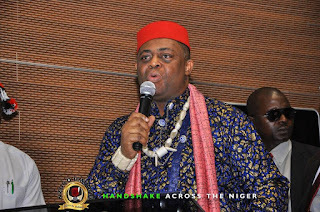 Meanwhile, some aggrieved group of Igbo women from Imo and Abia states who graced the event, in an uproar, described as “nonsense,” the statement credited to the President-General of Ohanaeze Ndigbo, Chief John Nnia Nwodo who canvassed for the restructuring of the country during his speech at the convocation. The women who interrupted his speech, wasted no time in announcing that what they want is an outright separate Biafra nation having being tired of Nigeria’s many injustices and skewed system. Shouting down on the Ohanaeze President while presenting his speech, they stated that restructuring would not solve Nigeria’s problems even as they regret that Nwodo was urinating on the graves of many young and old innocent lives slaughtered by soldiers during the Operation Python Dance which according to them, he failed to acknowledge. The aggrieved women also accused the Federal government of sitting idly, doing nothing against the incursion of Fulani herdsmen in the region, saying that innocent IPOB youths were brutally massacred for agitating against oppression and injustices in the country while the rampaging herdsmens are being pampered by the government. It took the intervention of Chairman of Local Organising Committee/Chairman of Capital Oil, Chief Ifeanyi Ubah, to calm the agitators whom he assured, would be given time to air their views.